The holidays are here, and you know what that means? Time to start making a list and checking it twice. There are so many gift choices out there, but what to choose for those special people in your life? 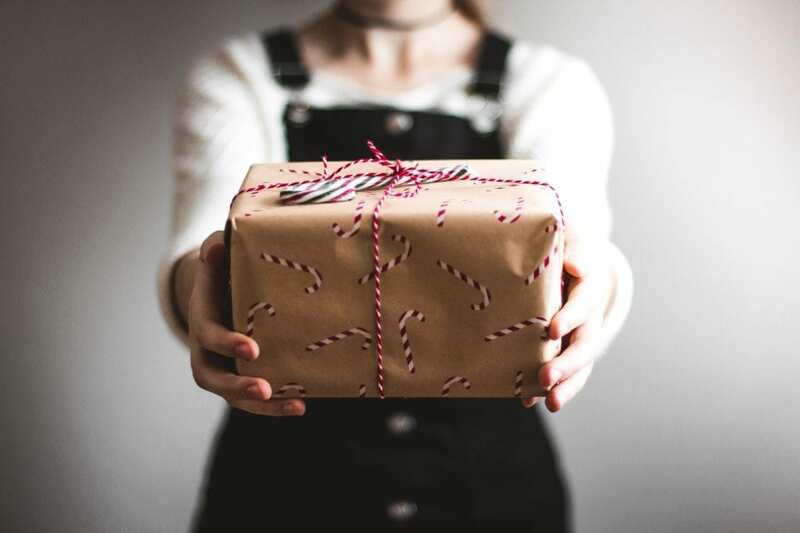 We have compiled a list of gift ideas that we believe will appeal to a broad range of your favorite peeps, whether they are avid travelers or just aspiring to finally take that weekend getaway or much overdue vacation time. 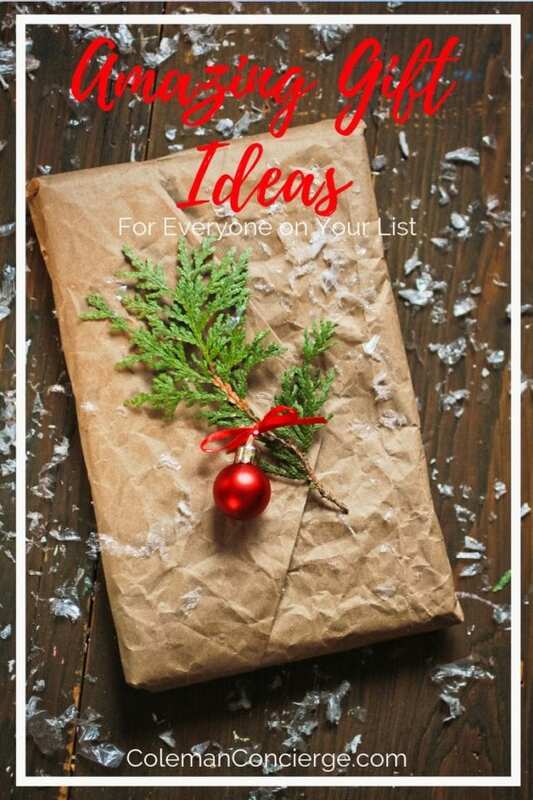 This list is travel inspired, though you don’t have to be a traveler to use or appreciate the gifts listed. 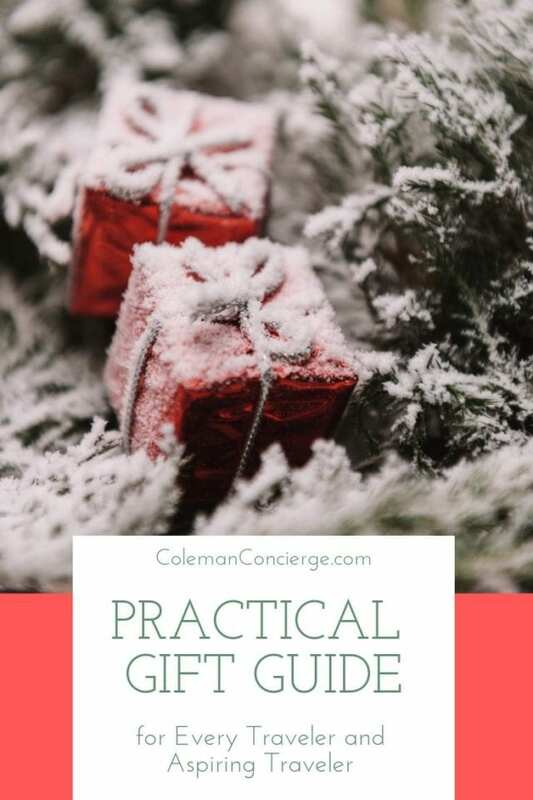 We have divided the gifts in this guide into 12 categories to help the decision process be as painless as possible, so you have more time for Netflix and chilling with a cup of nog. 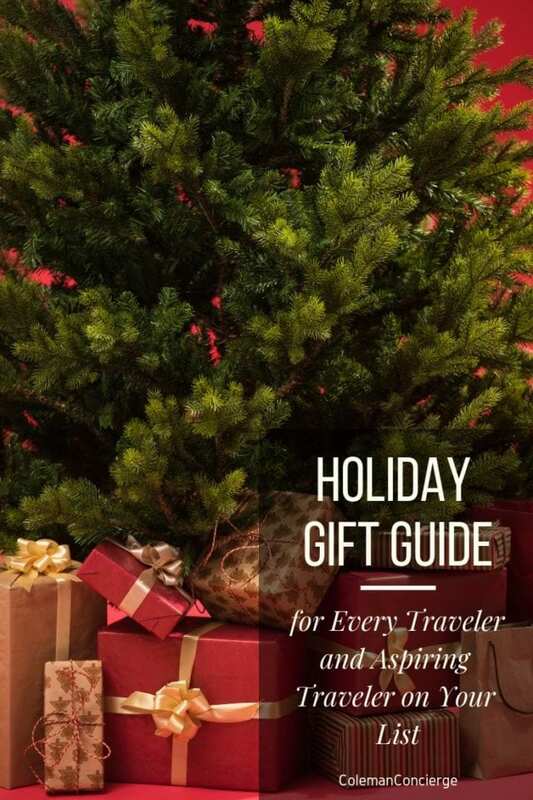 In the interest of full disclosure, this holiday gift guide contains Amazon affiliate links. Using them supports our work and helps us keep our site going – without any extra cost to you. So if you are using this guide, we would be super grateful if you do your gift shopping through these links. We have done our best to curate our favorite products to recommend to you! So with no further ado, let the shopping begin! Earbuds make a great gift for anyone. Whether traveling, working out, or just relaxing to your own sounds. We especially like these models for quality and weather resistance. We have a higher end model and one for more mid-priced one for both Apple and Android below. Everyone with earbuds needs a compact, tangle-free place to carry and store them. That’s where the nest comes in. Never be caught outside again with a dead battery. This portable solar power bank is high efficiency, super fast, and waterproof! Friends don’t let friends lose charge. This pocket-sized portable phone charger charges two phones at once with speed, temperature control, and surge protection. From cell phones to cameras to laptops, when traveling the world we have a myriad of devices we need to charge on the reg. That’s where an International Travel Adapter comes in. This one is super compact with 4 USB ports and works in over 150 countries. Sometimes one of the more frustrating things while travel is finding good wi-fi. The obvious answer is to carry your own. The Skyroam Solis is a mobile WiFi hotspot & power bank combo with unlimited data and 4G LTE. If you don’t have a photo it didn’t happen…right? Taking great photos is a must to capture those special moments in life. I was devastated when my GoPro was stolen in Niagara Falls. I needed to find a new underwater camera to take shots for our upcoming Cancun Trip stat! Enter my new favorite camera, the Sealife DC 2000 land and sea camera. With manual adjustability and 4 underwater shooting modes and built-in color correction, it is the perfect lightweight adventure camera for overland and undersea adventures. The #1 tip all professional photographers will tell you to getting tack-sharp gorgeous photos is stabilizing the camera with a tripod. Most are big and bulky but not the Joby Gorilla Pod. Small, strong, flexible, and stable, it is a great way to get great shots on the go. Out hiking or playing and want to shoot photos, but also want to keep your hand free sometimes? Enter the Peak Design Capture Camera Clip V3. It holds your camera during any physical activity while providing instant access for picture taking. Nothing hampers a good shot more than a dirty lens. This lens pen is compact and will work like a charm for all of your optical items. Packing cubes are on every avid traveler/ travel bloggers gift guide, and for good reason! I never understood what all the hoopla was about until we traveled to Thailand for almost a month with only a backpack. These babies keep your items organized and separated (think dirty stinky clothes) and packed so compactly you can fit more in your pack then you realized. These ones are our favorite. Carry all of your important travel documents like ID, passport, and credit cards in one organized place without fear of ID theft via scanning with an RFID blocking travel organizer. Looking for something more compact? This one is also RFID blocking and great for men and women. Not only is it important to keep your passport and credit cards safe while traveling, you also want to protect your phone. Being a bit of a klutz, I love the Lifeproof case. Ed tends to be hard on both phones and cases, so can confirm that Lifeproof has great customer service and a fast responsive warranty department. Ever wish you could sleep while sitting straight up? Whether in a plane, train, or automobile, you too can sleep in comfort with this handy memory foam travel pillow. We dig this guy because it comes with a soft washable cover and its own travel bag. We love to travel, but our biggest complaint is awful pillows. We have bamboo pillows at home, and they are amaz-balls! We are now ruined for all other pillows. Luckily we can now take our favorite pillow from home on the road without the bulk and never suffer a poor nights sleep again. Sometimes you just gotta block it all out to get a bit of rest. This set by Bedtime Bliss includes a sleep mask and earplugs in its own carry case to help you get some shut-eye. There is nothing that says relaxation more than slipping into some soft fuzzy sox. These are especially great because they have grippers on the bottom to keep you from losing that chill vibe with a fall on your bootie. One of the things that I always found challenging was how to fly carry-on and still have great hair. TSA allowances don’t allow for much liquid, and I hate all those little plastic bottles. Then I discovered shampoo and conditioner bars. These left my hair clean, soft and smelling delish. They also come with their own plastic container. While out on travel it is key to have 1 convenient toiletry bag that you can not only fit everything in, but you can easily find and access your items. These two are our winners for him and her. Say goodbye to your old toothbrush container. Keep your teeth and yourself healthy with this UV Toothbrush Sanitizer Case. Eliminates up to 99.9% of the germs and bacteria on your toothbrush. No matter who you are or what you have going, a travel towel is a darn good thing to have. We especially like this one because its large enough to use after the shower, soft, quick drying and super compact. When shopping, we make a point to use our own reusable grocery bags, but with both of us being blonde, we tend to forget them in the car. With these bags, that is a problem of the past. They fit in my purse, are washable and can carry up to 28 lb comfortably. One of the best things you can do for the oceans and baby sea turtles is to eliminate plastic straws, but what if you are a straw fan? We love these reusable straws. All the fun of straw sipping, and eco-conscious to boot. Speaking of being blonde, Ed and I are also quite fair-skinned. If Ed had his druthers he’d rock a full body latex onesie at the beach, lol! Being avid scuba divers, it is important to us keep the reefs just as safe as we want to keep our skin. This point was reinforced to us on our ethical snorkeling trip to Key West. That’s why this reef-safe biodegradable sunscreen is our new best friend. Do you want all the goodness of bottled water, none of the badness and waste of single-use plastic bottles? We make sure we have this guy with us at all times, especially on International travel. We stay hydrated and don’t contribute to the plastic waste epidemic. Since moving to Florida, it has become even more apparent that if we want to get outside and play there will usually be water involved. Whether we are kayaking, paddleboarding, canyoneering, or just taking a hike, there is always a chance of the random (or not so random) downpour. That’s why this daypack/ drybag is our new favorite. A headlamp makes a useful and practical gift for any outdoor lover on your list. This one is bright enough for most uses (although if you want to use it for cycling we’d recommend at least 360 lumens) and is both lightweight and convenient with USB changeability. My must-have hiking product is collapsible hiking poles hands down! I discovered this secret when my knees started to go. They got me through many a tough hike, including Havasu Falls with one artificial knee and one in need of replacement. They really do help diffuse the impact on potentially painful downhills. They also double a weapon in the event of an animal attack…lol! These are small enough to take in your suitcase or carry-on. Though not a necessity, a travel hammock is a little luxury that makes chill-time in the outdoors that much more zen. This one rocks because it fits two, double the chill, double the zen. Water purification products make for a great gift for anyone who is outdoorsy or an international traveler. These two are easily carried on any adventure. I’m not going to lie, we don’t have this item, but we want it so bad! We have a friend that has it, and it is awesome. We have a cat-cam that we used to watch the girls while on travel when we lived in San Diego, but 20 out of 24 hours (it seemed like) they would be on the cat tree, so camera location was easy. Now that we are in Florida, the house is bigger and potential cat locations have increased. This camera alerts the pets and incentivizes them to partake in a little camera time. Keep your favorite photos of your fur-babies close at hand with this digital photo frame. We are especially excited about this one because we were looking to get one as a gift a couple of years ago, but it was too expensive. This one is way more in the ballpark cost wise. This is seriously one of the cutest things we have seen for that crazy cat mom or dad, or small dog owner on the go that wants to include their pet on their day to day. The bonus is fashion colors and an astronaut vibe. PrAna makes travel, adventure and yoga clothes that are practical, ethical and stylish. We love that this brand is inclusive (goes up to size XXL-18 for women, XXXL 43-44 for men) and cares about fair trade and sustainability. Wins all around for them in our book. This one is just for the ladies…. If you are a bit on the Rubenesque as I am, or just have narrow hips, when wearing a skirt or dress inner thigh chaffing is real…and awful…real awful! Hot climates are the worst! My secret weapon is a tight, moisture-wicking yoga-type shorts. In a pinch, you can always swipe a pair of your man’s synthetic boxer briefs, but these babies are comfy, have tummy-control. and a stash pocket. I bet his chonies don’t have those features! It doesn’t matter if you are a dude or a lady, one of the best items you can take on travel, especially to somewhere beachy of to SE Asia is a sarong. It can compensate for an accidental pair of shorts or tank top if visiting a temple, works as a beach blanket, swim cover-up, changing room, scarf, pillow, light blanket, impromptu going out attire…and I could go on and on. Anyone that knows Ed and I knows that, not only does coffee play an integral part of our morning routine, it is practically imperative to our day to day functions. As a matter of fact, several of our wedding vows to one another involve coffee. The AeroPress Coffee Maker is easy to use and clean up and has gotten us through many road trips and camping excursions. This little gem of a travel mug is great for both the coffee and tea connoisseur in your life. Freshly pressed coffee and tea all around! If espresso is your poison and regular coffee just won’t do, this is the gift to get. Small and super lightweight with superior pressure pumping power, you will get that perfect 1/4 inch of crema on your shots. A spillproof reusable coffee/tea travel mug makes the perfect gift for any hot beverage lover on the list. We love this one because it comes in all kinds of awesome colors and vacuum seals. One thing we all have in common, and can’t be denied, is our need and love of entertainment. Regardless of our location, be it at home or traveling. We have put together a few of our most entertaining picks. The best thing you can get for the book lover on your list is a Kindle. We love this one because it is reasonably priced with a glare-free touchscreen and a free subscription to Audible. If you prefer to read your books the old school way, and want them with a side of travel inspiration, you will love Ultimate Journeys for Two by our friends Mike & Anne of HoneyTrek.com. They have written National Geographic’s first book on couples travel. In this gorgeous coffee-table-meets-guide, they’ve pinpointed their 75 favorite destinations, best tips, most inspiring stories, and handiest travel hacks. It’s organized by type of experience–so no matter if you (or that couple on your holiday list) are into beaches, mountains, deserts, or road trips, you’ll find amazing new places to match your style. Games can be a great way to not only pass the time but to bring people together. The new generation of card games are mobile and provide hours of laughs, not to mention valuable insights into the psyches of your friends, family members, and travel companions. The first game shown, Cards Against Humanity, has been a longstanding holiday tradition in the Coleman household. Does that make us horrible people? For those in your life that have everything or are just straight up hard to shop for, the Gift Card is like manna from shopping heaven. Here are a few of our picks. You guys are still here? Thanks for staying with us through all 12 categories and almost 60 items. We hope that you found a gift or two that you would be proud to give. We know that we put a lot of thought into this list for you. We also hope that you all have a safe and happy holiday season filled with joy, laughter, family, and the perfect gift. Disclosure: Please note that some of the links above are affiliate links, and at no additional cost to you, we earn a commission if you make a purchase. We would never recommend anything we don’t personally love, and the income goes to keeping this site updated and free for everyone! PreviousKayaking Silver Springs – Monkeys, Manatees and Gators…Oh My!